When you think of summer lipsticks you imagine pinks, oranges, nudes and corals. Now think of your favorite berry lipstick....I am sure you imagined the Fall season. 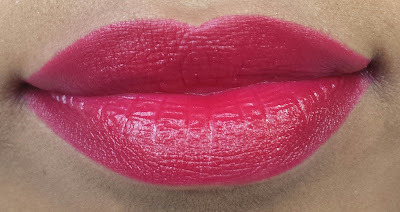 If you love a cool or warm tone berry lipstick get it out and wear it this summer. Berry lipsticks can be worn in the Summer too! The color has been seen on a lot MUA's and celebrities such as Rihanna and Kendall Jenner. This trend is a great way to mix up your lipstick and transition into the colder months. Find a berry tone that works great for your skin tone by heading to your local drugstore or beauty counter. I found a beautiful berry cool tone lipstick from the Wet n Wild collection. #2 Line lips with lip liner or use a lip brush to apply perfectly. #3 Place a piece of tissue over mouth and sweep translucent powder over your lips. This will ensure your lipstick last longer. Here is how I wore my cool tone berry lipstick Cherry Picking. I used a lip brush to achieve the crisp edges.